However, mono-coloured Commander decks are not especially powerful compared to three or even two-colour decks because they simply lack the card pool of decks with more colours. Part of the problem is that there aren’t always answers for some card types, and that there doesn’t seem to be much reason to play mono-colour in the first place compounds that. Solutions to these problems are closer than one would think. A chief problem for many colours is modes of removal. Red and black have difficulty with enchantments, and green has only a handful of cards for dealing with creatures. Blue often relies on countering spells that they would otherwise have trouble removing, but as any blue player will tell you, one can only leave your mana free so long before it feels like you’re doing nothing. For most mono-colour decks, the Scars of Mirrodin block was a great boon: Scars block saw the strongest single-target or focused target colourless destruction ‘spells’, ever. These cards are Argentum Armor, Steel Hellkite, Spine of Ish Sah, and Karn Liberated. They’re expensive, but if you’re playing black and you need to bust an enchantment or artifact, any of these will do fine. Argentum Armor is the most costly and least timely of the bunch; it will probably cost 6 mana to cast, and then another 6 to equip. There are ways to circumvent either or both of these costs; Godo, Bandit Warlord, Brass Squire, Stoneforge Mystic, Puresteel Paladin or even Vulshok Battlemaster can either put Argentum Armor onto the battlefield for a nominal cost, or allow for a free but these effects are fairly uncommon. More than likely, you will be paying 12 mana, only to eat a Naturalize effect. On the other side of the coin, an unanswered Argentum Armor can easily be a game in the bag. Steel Hellkite is a lot like Argentum Armor, except that you feel like you negotiated a better deal: it’s got a built-in delivery system, and instead of paying all the fees before any service, the Hellkite offers a half now and half later sort of deal. Unlike Argentum Armor, Steel Hellkite can be sandbagged by blockers. Anyone who’s ever tried to destroy a Bitterblossom with this guy will know what I’m talking about. Still, Steel Hellkite can destroy cards with Shroud or Hexproof, and can always be relied upon to be a simple beater when there are no permanents in dire need of destruction. 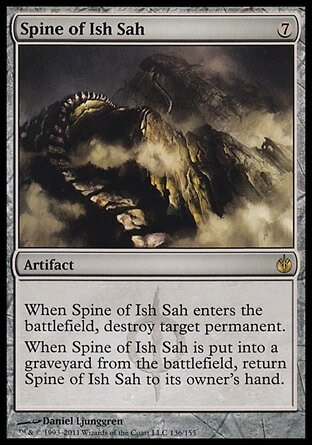 Spine of Ish Sah is the first ‘spell’ for this sort of thing; there is no red zone required, you simply pay your seven mana up front, and you get to destroy a permanent. However, this card offers a tantalizing capacity for reuse: if you can get it destroyed, you could use it again. There are a lot of ways to do this, outside of cards like Akroma’s Vengeance or Oblivion Stone; adding one more red mana on to a Shattering Spree, sacrificing it to Greater Gargadon or Braids, Cabal Minion, and using Despotic Scepter on it will all work. Since we’re talking about mono-colour, even Phyrexia’s Core would work; all you’d have to do is replace a basic land. Last from Scars block is Karn Liberated. This card will do more than the others, since it exiles cards (like those that regenerate, or are indestructible), and will probably take some damage for you as other players look to eliminate him from the board. If left unchecked, Karn can easily let a player win through his ultimate, and can be a huge problem if he’s played just after a Wrath of God effect. Another problem for mono-colour decks out of green is weak ramp. Often, multi-colour commander decks have green in them, simply because there are only so many colours to choose from, and picking more than one will result in only a few combinations. Mono-colour decks are frequently without green’s mana ramp, and are forced to rely on less conventional means of getting more land out, faster. The first place many people look is in the mana rock department. There are a great many two mana artifacts that produce mana for multicoloured like the Ravnica block signets (Boros Signet, and others), or the Mirrodin talismans (Talisman of Dominance and its ilk), but there are only a handful for mono-colour decks: the Mirage diamonds (Diamonds like Sky Diamond), Coldsteel Heart, Star Compass,Mind Stone, Fellwar Stone and Guardian Idol. There are a few better mana rocks, like Thran Dynamo, and a couple of ways of putting lands into play directly, such as Solemn Simulacrum and Wayfarer’s Bauble. But, not all hope lies with those artifacts. More than anything, hitting your land drops each turn is perhaps the most important aspect of this game. One aspect of deckbuilding that remains a mystery to many is why players include 24 lands in 60 card decks, and seem to maintain that ratio when creating larger decks. The trick is that a 40% land count offers the greatest likelihood of playing four lands in four turns. The math is simple: on the fourth turn, if you took the first turn, you will have seen 10 cards (seven in your starting hand, and three from your three draw steps). For Commander, there is often a desire to play a land each turn for much longer; after all, it takes a lot of juice to kick a Rite of Replication, or play a solid finisher. To that end, playing cards like Armillary Sphere or Journeyer’s Kite are great ways to keep moving toward having a critical mass of mana. Of course, playing a mono-colour deck is not all gloom in overpriced removal and weak ramp. There are distinct advantages to playing a single colour. The first one that most people call to mind are the ‘gauntlet’-style effects. 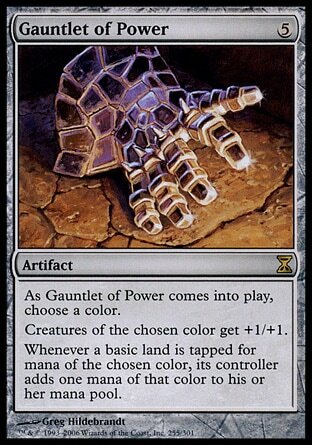 Gauntlet of Power, Caged Sun and Extraplanar Lens each can provide a mono-colour deck with a great deal of mana. Thankfully, every colour has spells that can use more and more mana; White can use Divine Deflection, Decree of Justice, Entreat the Angels or Martial Coup. Blue has a number of spells that could allow its caster to draw X cards. Black has drain spells, while red has had scaling burn spells since the game’s inception. Green has a few niche spells, like Primordial Hydra, Gelatinous Genesis and Genesis Wave. There are other variants for specific colours, like Nirkana Revenant or High Tide, and these can also be used to leverage the same advantages. Finally, if you’re playing mono-colour, Strata Scythe has your name on it, especially if you’re into using Armillary Sphere and/or Journeyer’s Kite. If you find yourself not particularly fond of Strata Scythe or Extraplanar Lens, try making half your basic lands the snow type. The reason being, you never know when someone is going to pull a Wake of Destruction or Invader Parasite on you. When I talk with people about mono-colour decks, they often ask why they would bother, citing all the removal issues. Often, there are aberrant cards in each colour that would fill in that niche, like Gate to Phyrexia in mono-black, or Beast Within for mono-green. The mechanical advantages for mono-colour are present, but not always obvious; the large amounts of mana created by Gauntlet effects can be used effectively in a lot of ways, like leveling creatures. With a little creativity and tech, mono-colours are quite enjoyable.